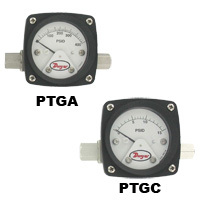 The Series PTGA and PTGC Differential Pressure Piston-Type Gages can be used to measure the pressure drop across filters, strainers, pump performance testing, and heat exchanger pressure drop monitoring. Its simple, rugged design possesses a weather and corrosion resistant gage front with a shatter resistant lens. The Series PTGA and PTGC contain a piston-sensing element, which provides differential pressure ranges from 0-10 psid through 0-400 psid. Constructed from aluminum or 316 Stainless Steel and available with two 1/4" female NPT end connections, the gages provides over range protection rated to 5000 psig (340 bar). Wetted Materials: Gage Body: Aluminum or 316 SS; Piston: 316 SS; Spring: 316 SS; Ceramic Magnet; End Plugs: Aluminum (Aluminum Body), 316 SS (SS Body); Seals: Buna-N (standard). Dial Case: "Engineered Plastic" with shatter-resistant acrylic lens. Accuracy: PTGA: ±3-2-3% of full scale in accordance with ASME B40.100 Grade B; PTGC: ±5% of full scale ascending. Pressure Limits: Working pressure 5000 psig (340 bar); Proof Pressure 10,000 psig (689 bar). Temperature Limits: -40 to 200°F (-40 to 93°C). Size: 2.5" (63 mm) or 4.5" (115 mm). Mounting Orientation: Mount in any position. Process Connections: 1/4" female NPT end connections. Weight: Aluminum: 2.5": 0.60 lb (0.27 kg), 4.5": 0.95 lb (0.43 kg); 316 SS: 2.5": 1.35 lb (0.61 kg), 4.5": 1.60 lb (0.73 kg). EXAMPLE PTGA A A 51 EC N Series PTGA-AA51EC-N 2.5" Differential Pressure Piston-Type Gage, aluminum wetted parts, range 150 psid, 1/4" female NPT end connection, with neoprene seals. EXAMPLE PTGB A A 01 BC N Series PTGB-AA01BC-N 2.5" Differential Pressure Piston-Type Gage, aluminum wetted parts, range 10 psid, 1/4" female NPT back connection, with neoprene seals.